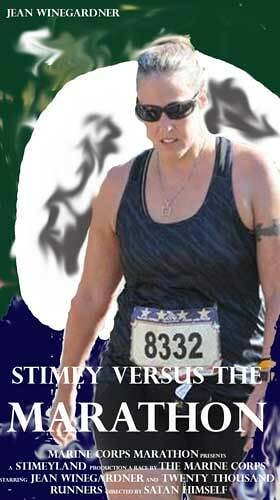 or, if you want to be dramatic about the whole thing: Stimey Versus the Marathon. (Hat tip to Joe Versus the Volcano) Do you see that little tag hanging off of my race bib? It was my “free beer at the finish line” coupon. I knew I didn’t want a free beer, but I left it there juuuuuuust in case I changed my mind. It mildly bothered me for 26.2 miles. I didn’t want a free beer at the finish line. I knew I didn’t want a free beer at the finish line. I should have ripped it off at the start line. Hey guys! I ran myself a marathon a couple weeks ago! I gotta tell you, I really did learn some things about marathons during this race. I also learned some things about myself. And I learned some things about marathons as they relate to myself. It was quite a mental journey. 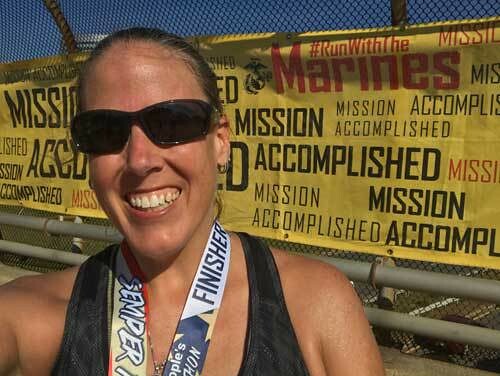 If I had a bucket list, the Marine Corps Marathon would have been on it. My dad and my uncle were both marines and I have a fondness for that military branch. 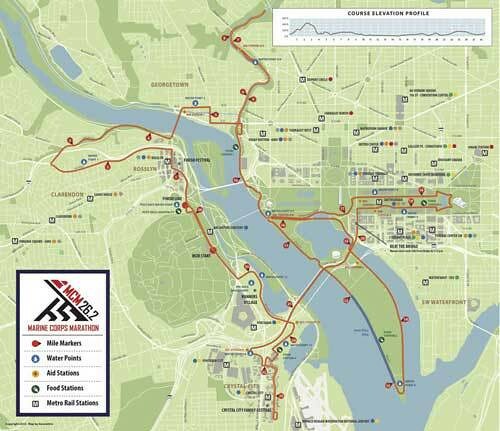 Plus, it's a big, local marathon that takes runners sightseeing all over DC. 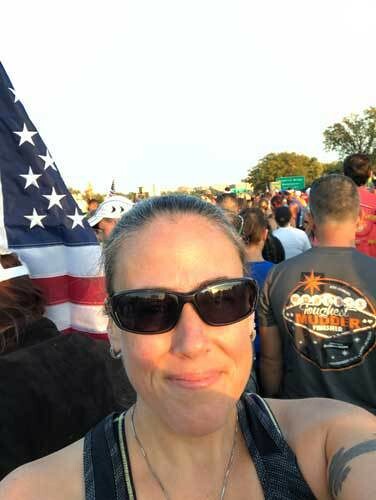 I have wanted to run this race for a long time, so after I ran the Houston Marathon and was looking to do another one, hopefully faster and better, MCM was a natural choice. What could possibly go wrong? My hope and goal going into this marathon was to not have to take walk breaks (other than through water stops, because I ALWAYS walk through water stops) and to hopefully finish it faster than I finished Houston. Neither of those things happened. And I'm okay with that. I finished in 6:14:53 and I took a lot of walk breaks. Frankly, after about mile 15, I shuffled through the last 11 miles, either at a walk or a slow run. One of the things I learned about myself is that I am a person who, at this point in my running career, cannot run a marathon without taking walk breaks and that is GREAT. Because I have finished two marathons and I feel pretty darn good about that. Even getting to the start of the marathon was an ordeal. The Metro opened at 6am and I was on a train at 6:05. Trouble started when I and 80 gajillion of my closest friends got off the train at the Pentagon and tried to get up the escalators from the train platform. It took at least 15 minutes to do that, and the lines continued from there. By the time I got to the pre-race runners' village, it was well after 7 and every line for the porta potties was long enough to make me late to the start line. I had read the race booklet though, because I'm a nerd like that, and it said there were "150 lesser used" porta potties on the road where they start the race. I crossed my fingers and continued up the road, hoping they weren't lying to me. Happily, the race booklet was right and I only had to wait behind about five people. 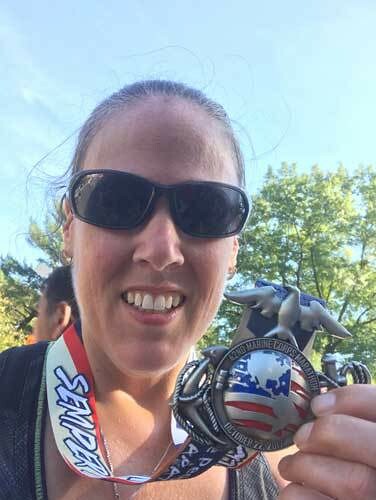 I was very pleased with myself and also very relieved that I didn't have to run a marathon with, like, 40 ounces of liquid sloshing around my insides. I wormed my way up to the start line by 7:40, a full 15 minutes before the race was supposed to start. It was not a stress free or relaxing start to my day. But at least I wasn't sweaty yet. Much. Look how dry and non-crampy I look. There are three time cutoffs in the MCM (mile 17 at about 4-1/2 hours, mile 20 at 5-1/4 hours, and mile 22 at 5-3/4 hours). I was pretty sure that, barring disaster, I would make these cutoffs pretty easily. I was, however, worried that it would take me half an hour to get over the start line because I was in the back of the pack and that time would get me DNFed. Happily, things went smoothly, and even though they started the race ten minutes late, I was over the start in just a few minutes. After I crossed the start line, I ran for six and a quarter hours and then I finished. The end. But there's some truth to that. I spent a lot of time in my head during this race. My only constant was continued forward motion—except for that time I dropped my Clif Bloks and had to run backwards to pick them up. Otherwise, it was one foot in front of the other over and over and over. This will sound obvious to all of you, but it hit me hard at about mile ten: Marathons are long. I felt tired pretty early on, but I've run tired before. It was fun to run down into Hains Point because that was the location of my first 10K almost exactly four years ago. Hains Point is also the location of the wear blue mile honoring fallen service members, which is really quite an amazing thing. I have never run a mile in a race where it was so quiet. After all of that, you get to the halfway mark, which is great because then at that point you're all in because it's too late to turn around and walk back. (<—joke) Actually what the halfway mark means is that then you have to do what you've just done...again. But! Every step after the halfway mark is taken on the down side of the mileage. Well. It made sense to me. There are all kinds of mind games I play with myself on long runs. I ran for something like 16 years to get off of the peninsula. I knew that the national mall section was coming up and I was looking forward to that, but I forgot the two-something additional miles down and back Independence Avenue before that. I'm pretty sure there were monuments and views to look at, but I didn't see any of that. (See: "I spent a lot of time in my head.") I think it was in this area that I took my first walk break. See it up there to the left of the Capitol? The shaft portion was tough. 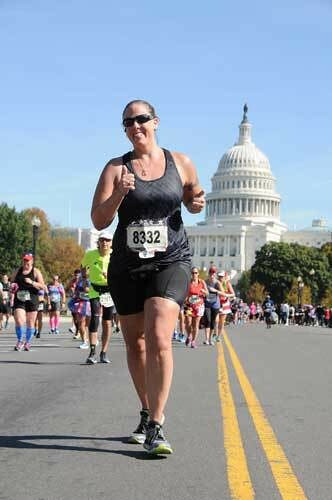 I had expected to be a little more excited about running around the mall and past the Capitol, but mostly I was just tired and parts of my body were trying to cramp up, which is not something I usually experience. I stopped to stretch a few times, but I would, like, stretch my hamstring and my quad would seize up. At one point later in the race, I was moving from a walk to a run and my ankle tried to cramp. My ANKLE. I didn't even know that could happen. None of that is evident from this oddly cheerful photo though. I mean, except you can tell I’m going, like, 4MPH because even though I’m running, both of my feet are aaaaaaalmost on the ground. 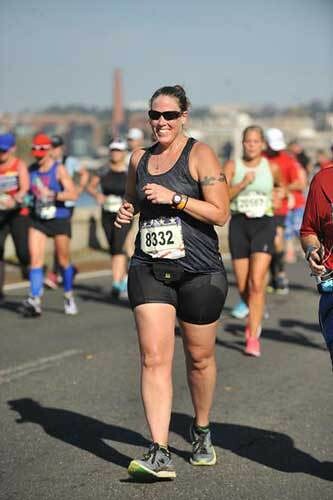 Mile 20 is where you "Beat the Bridge," meaning you cross over the 14th Street Bridge before the cutoff. People were very pleased to have made it. A woman right behind me stopped suddenly with a cry of pain and I turned around and asked her if she was okay and she gave me this quizzical look and I was all, "I mean, you know," and gestured at the road indicating the base level of suffering I was hoping she hadn't crossed. This woman had zero words she could formulate about her state of being, but she nodded, so I carried on. It was right around here that I determined that because I wasn't going to win any land-speed records—or even Jean-speed records—that I was going to be cheerful and make jokes and generally try to have a good time for the rest of the race and not worry about my time at all. I figured I could kill myself trying to shave 15 minutes off of my time or I could enjoy myself—you know, to the extent that you can enjoy the last 10K of a marathon. I was taking significant walk breaks by this time and I was not alone. It seemed like most people were doing the same. The last cutoff point was at mile 22. After that, I heard some people who were all, "Now we can walk the rest of the way. We did it!" Frankly, by the end of the race back at my end, many people didn't seem to be doing any running at all, which was gratifying because I got to pass them. You know, verrrrryy slooooowly. The bridge and subsequent descent into Crystal City was kinda brutal. It was HOT by this time and there was no shade. A marine was encouraging us by claiming that there was shade and water up ahead. He was right, and even better than that, there was also a fire hose spraying water into the air that we could run through. That was fantastic. There were maybe three or four of those in the next few miles, but one of them was on the far outside of a corner instead of the inside and after much internal debate I decided that I didn't want to run the extra 20 feet, so I skipped it. I ran through the rest of them though. Crystal City really pulled it out for us. Some lady gave me a handful of ice and at first I was all, "I really only need one of these, what am I going to do with the rest?" and then I discovered that each ice cube actually had four uses: (1) keeping my hand cool, (2) keeping my forehead cool when I wiped it with the ice cube, (3) cooling off the inside of me when I put it in my mouth, and (4) making me less thirsty. I realized at this point that I had lost all sense of personal hygiene (yes, I'll wipe that on my body then eat it) and also, damn, I had been really hot. That ice pepped me up enough that I ran at a reasonable pace for a decent chunk of time. A kid gave me a tiny cup of ice cubes later on and when I still had some ice in there, a different woman filled it with water and I had maybe two swallows of ice water at mile 23 and it was DIVINE. After that, it was just a matter of slugging it out to the end along a long, hot road. I think you can start to really see my sunburn here. I didn’t feel it until hours later. I had other pains to deal with. I amused myself by making little quips to other runners. ("Ouch. Ouch. Ouch. Ouch. Ouch," I told one woman I passed. "All the things on me hurt," I said to a cheering bystander as I gestured at myself from head to toe. "If my watch says 26.2, does that mean I can stop?" I asked another, who told me her watch said the same thing. And so on.) There were others who were doing the same, and I found it very endearing. The last quarter of a mile or so involves a left turn up a hill and then a flat tenth of a mile or so through the finish line. I didn't sprint the hill or anything, but I have never felt a hill less. At this point, there was nothing that could put me through more exertion. Plus, I knew once I hit the finish line, I could stop running. That medic wasn’t there for me. I swear it. 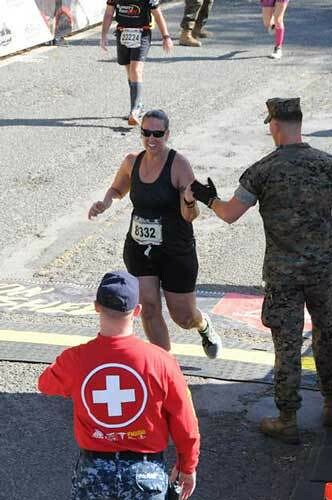 There was a long line of marines standing in a line after the finish line giving high fives and handshakes to finishers. It was really cool. Although I think part of their purpose was to distract us from the long walk we had to make to the finish festival. Before we left the finish area, there were marines giving out medals. But they weren't just handing them to finishers. The woman who gave me mine put it over my head and then saluted me. It was quite a moment. A marine...saluting me. I felt pretty honored. Alex met me at the finish to drive me home, thank God, because I can't even imagine standing in the line to catch a bus back to a metro station and then sitting on a train with all my sweatiest buddies. I ran 26.2 (or 26.73 according to my Garmin, but who's quibbling?) miles, but Alex drove me home and he's kind of a hero for that. He did make me walk up a hill to get to the car and he did walk faster than me, forcing me to hobble to keep up with him, but that's okay. Also, like, three body parts seized up on me when I got into the car and I had to contort into a plank position in the seat to work all the cramps out. And that was the 2017 Marine Corps Marathon. It was a journey, both literal and metaphorical. Like, I said, I learned that it's okay for me to walk during a marathon and I don't feel the slightest bit bad about it. I also learned that if you ever ask me how a marathon is, I will answer you by saying "hard." Always and forever. Marathons are no goddamn joke. Another lesson was to get out of my head and focus on the experience, something I intended to do going into the race, but only managed to do for some of the miles. Another very important thing I learned is that my body did the absolute best it could do at this distance. I realize that at my body weight and fitness level, I am not going to be running any speedier marathons any time soon. I think I might work on those things for a while and then maybe run another marathon in two or three years. I'm not saying never again, but I also know that two marathon training cycles basically on top of each other kinda wrecked me and I need to put in some serious work on myself before attempting it again. Lastly, I learned that it is a good idea to buy a sweatshirt with an ostentatious marathon logo on it for two reasons. 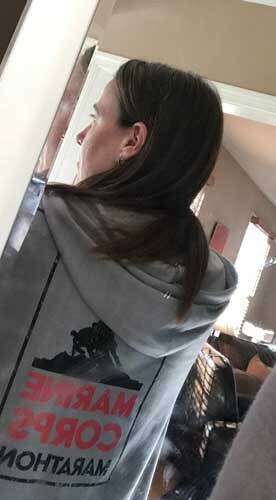 First, because if you spend a million dollars on a hoodie at the expo, you will finish the goddamn race so you can legitimately wear the thing. Also I learned how hard it is to take a mirror photo of your own back. And, second, because if you wear it, people ask you if you ran a marathon. And you get to say yes. And they don't care that it took you more than six hours. And you don't really care either. And everyone feels good about the accomplishment that you achieved. No one more than you. Mission accomplished. Semper fi, motherfuckers. I love this! Congrats on another marathon. That day was HOT! Thanks!! Congrats to you too. You killed this race! You are awesome. And my hero! I can't even imagine walking a marathon, let alone running most of it. You rock!!! Thank you! It is quite a thing. You have no idea how much you impress me every single day, but THIS is just crazy awesome. You're amazing!! Compliments from you totally make my day. Thank you!